This past Christmas, my coffee game got a serious upgrade. Despite having a name that conjures up images of a "special move" (or a triceps exercise) this most ingenious device is actually the hands down, no holds barred, best way to brew a cup of coffee. It is, in other words, a French press. 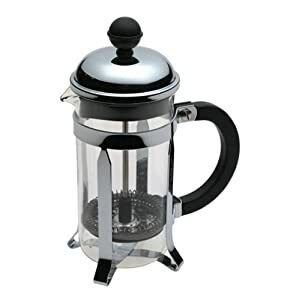 In simplest terms, you operate a French press by steeping the coffee grounds in hot water just like you would loose tea. Then, you "press" by pushing a wire filter through the liquid. The filter is precisely the same diameter as the accompanying glass pitcher, which insures that all the grounds are retained at the very bottom of the container. What you are left with is a pure ebony liquid that defies expectation. My first taste of French pressed coffee was a revelation. This beverage that I thought so familiar and predictable, had transformed. This was not the same morning pick-me-up that needed cream (or coconut milk) in order to be palatable. It was black and smooth and rich and wonderful. Gone was the bitterness, the signature "Char-bucks" flavor, replaced instead with the smokey sweet essence of pure roasted coffee beans. However, there was an unforeseen consequence to having the motivation, and the means, to make great coffee. I made too much, drank too much, and went into a caffeine induced mania of epic proportions. Hesitant to repeat "The Great Caffeinating", I began a search for ways to utilize leftover coffee. The Mocha Chip Smoothie is the result of this search (and my search for the ultimate chocolate experience). Combine all ingredients (except cacao nibs) in a blender and mix until smooth. Add more or less almond milk to reach desired consistency. The amount of dates that you use can also be adjusted to increase or decrease the sugar content. Top with cacao nibs and enjoy the buzz! Want to step up your own coffee game? I suggest you pick one of these chrome bad boys up. This sounds awesome. My last attempt at a Paleo "Frappuccino" failed because I used coconut milk, and all the coconut oil in the milk congealed into a big glob. Didn't think of almond milk! Glad you like the recipe Jamie! I agree, coconut milk is a little too rich, and almond milk helps thin it out without watering it down too much. Hope all is well with you and the family! Thank you Leah! I'd love to hear any suggestions you might have for making it better!